Iris-like plant with narrow leaves and spikes of sky blue flowers opening in the early morning. [Wrigley]. ‘This was first discovered upon Kangaroo Island, off the south coast of New Holland, in 1803, by Mr. Brown, but with no perfect fructification. It was subsequently observed in the same place, in a similar state, by M. Leschenault; and has lately been detected with ripe fruit upon the same island, by Mr. William Baxter, collector to Mr. Henchman. No other station has yet been found for it. It is a half-hardy, evergreen, herbaceous plant, and perhaps may be preserved in the winter in the open border, with a little protection. Its beautiful sky-blue flowers are produced in abundance from May to July; but they open only in the early part of the day. Our drawing was made at Mr. Mackay's Nursery, in June last. We do not find a single point of structure in which this plant recedes from Sisyrinchium. Its habit is the same; its stamens are inserted opposite the outer segments of the flower, and alternate with the styles; the stigmata are those of Sisyrinchium; and, as far as is at present known, the fruit also. The separation of the filaments in this plant is a character common to it with many admitted Sisyrinchia, and has been noticed both by Mr. Brown, in his Prodromus, and Mr. Ker, in his recent revision of the genera of Irideae, under Marica, from which he does not distinguish Sisyrinchium. It is remarkable that this species should not possess the peculiar distinction of the two other New Holland Sisyrinchiums, in having the outer segments of the flower narrowest; a curious character, which, Mr. Brown observes, they possess in common with a third from New Zealand, and which induces a suspicion of their forming a particular genus.’ [BR f.1090/1827]. 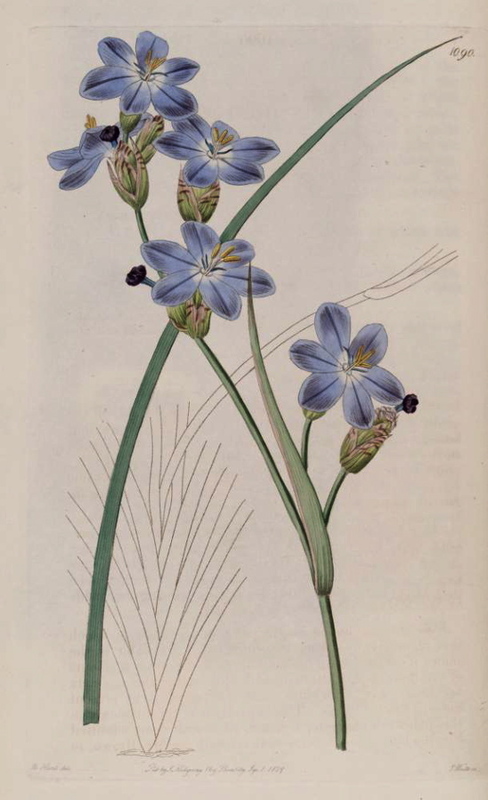 Libertia cyanea is marked with a ‘c’ in an 1836 edition of Loddiges’ catalogue held at Camden Park [CPA]. In William Macarthur’s code, used and explained elsewhere, this means grown at Camden. It is almost certain that it was grown in the gardens around this time but may have been short lived as it did not appear in the catalogues.